Laserase Croydon can help reduce discolouration of the skin, both lighter (hypopigmented) and darker (hyperpigmented) areas, utilising different laser systems. With respect to darker pigment irregularities, Intense Pulsed Light (IPL) is effective in treating age and liver spots (solar lentigo) and freckles (ephelides). The broadband light is absorbed by the pigment “melanin”, where it is converted into heat causing break up of the darker areas. With respect to lighter pigment irregularities, UVB-targeted phototherapy is effective in the treatment of vitiligo, psoriasis, stretch marks and pale scars. All areas of the body can be treated, but IPL treatments are not suitable for very dark skin types. A series of 3 to 6 treatments is recommended at monthly intervals. Methods to reduce further collagen breakdown include smoking cessation and the application of a moisturiser with SPF30 sun block. These will enhance the efficacy of the treatment. It must be remembered that the skin is constantly ageing, so it is envisaged that further treatments in the future may well be desirable. 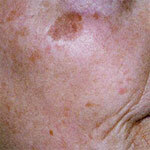 The effects of the treatment maybe prolonged with the use of medical grade skin care products.